Tuesday, April 30, 5:30 pm for dish-to-pass, 6:45 for discussion. 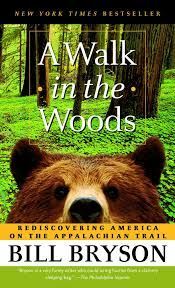 Book -- We are going to revisit a 20-year-old outdoor lovers' classic, A Walk in the Woods by Bill Bryson. Availability is very good in the library right now so grab a book before others do or get your hold in to the system. Many used copies are available on Amazon for a dollar or two, but generally you have to add $3.95 for shipping. Bill Bryson decided to reacquaint himself with his native country by walking the 2,100-mile Appalachian Trail... The AT offers an astonishing landscape of silent forests and sparkling lakes--and to a writer with the comic genius of Bill Bryson, it also provides endless opportunities to witness the majestic silliness of his fellow human beings.... But A Walk in the Woods is more than just a laugh-out-loud hike. Bryson's acute eye is a wise witness to this beautiful but fragile trail, and as he tells its fascinating history, he makes a moving plea for the conservation of America's last great wilderness. An adventure, a comedy, and a celebration, A Walk in the Woods is destined to become a modern classic of travel literature. Questions or comments? Contact Dianne Emmick at demmick@juno.com or Carol Knowles@cah3826@yahoo.com.